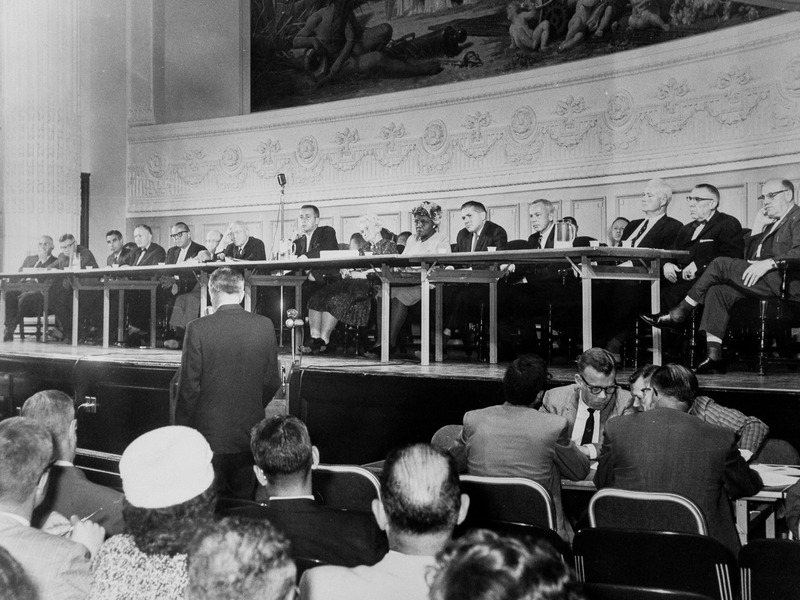 On August 1, 1961, the Temporary State Commission on the Capital City held the first of two public hearings on Albany’s rehabilitation. (Eight months later, of course, the Commission would approve Gov. Rockefeller’s plan to demolish 98 acres in downtown Albany for the South Mall.) The hearing, held on a sweltering night in the un-air-conditioned Chancellors Hall in the State Education Building, lasted from 8:00 to 11:00pm. At the August 1961 Temporary Commission hearing in Chancellors Hall. New York State Archives. This Hy Rosen cartoon accompanied the Times Union’s 1962 endorsement of Harder. Used by permission of the Times Union. This incident launched Harder’s career as a political activist. Had he chosen to align himself with boss Dan O’Connell’s Democrats, Harder likely would have won elected office. His father, after all, had been secretary of the statewide Democratic committee, as well as secretary to Lt. Gov. Edwin Corning (the mayor’s father) during the Al Smith administration. 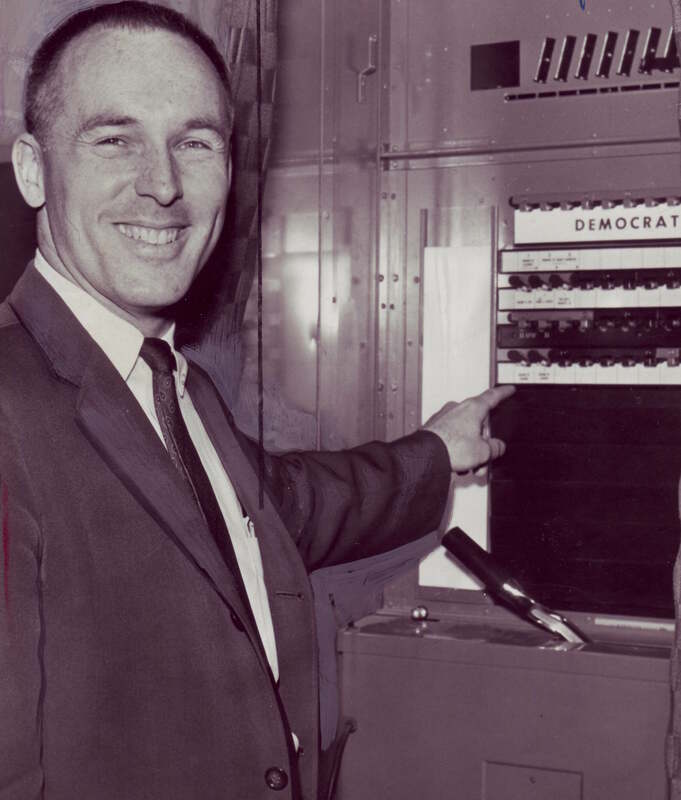 Yet Harder chose to challenge the machine’s power by running in 1962 for the Democratic nomination for State Assembly against incumbent Frank Cox. This was the first contested Democratic primary in Albany since 1921. Loyal Democrats did not take Harder’s insurgency seriously. At the county Democratic committee meeting in July 1962, the presiding officer, Mary Marcy, refused to recognize Harder’s right to speak. 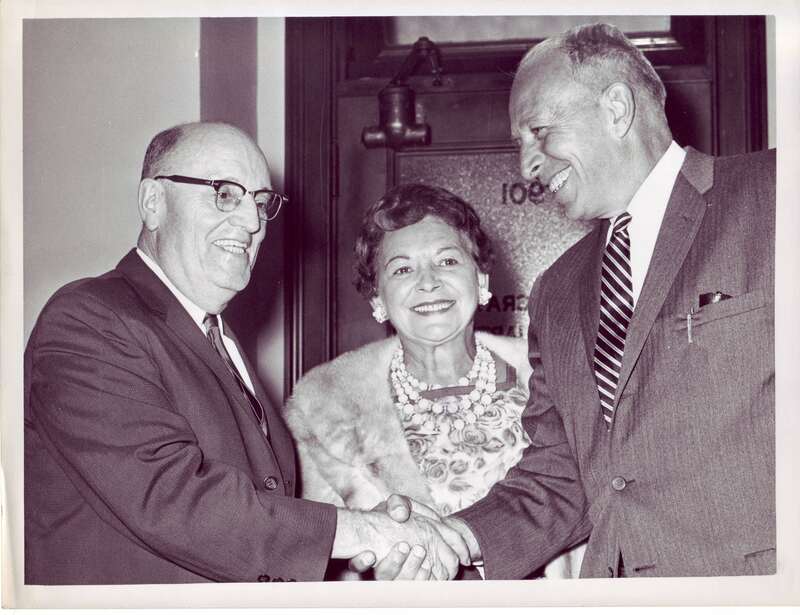 Mayor Erastus Corning shakes the hand of Frank Cox, following his resounding 1962 primary victory against George Harder. Used by permission of the Times Union. Both the Times Union and the Knickerbocker News endorsed Harder in the primary. Harder and his small but enthusiastic band of supporters campaigned hard. Yet Cox won handily by a 72% to 28% margin. Harder ran for State Assembly twice again, in 1964 against Cox and in 1965 against Harvey Lifset. Harder’s campaign slogan, “We Try Harder,” was borrowed from the Avis rental car company’s advertising strategy, which portrayed it as a plucky underdog. Despite running vigorous campaigns and securing the endorsement of both local newspapers, Harder again lost—by even bigger margins. At the time, Harder’s poor showing at the polls seemed to confirm the enduring power of the O’Connell-Corning machine. After all, the Democratic organization twice ran a hack against a young, charismatic reformer—and won handily. (In a 1984 interview with SUNY Albany graduate student Katie Gurnett, Harder described Cox as “the fulfillment of Dan [O’Connell]’s adage” that he could “elect a dog, or the family cat.”) But Harder’s campaigns, along with those of the independent Citizens United Reform Effort (CURE), were the earliest signs that the Democratic organization’s grip on Albany was weakening. Harder prepares to vote in the 1964 Democratic primary. Used by permission of the Times Union. Although he did not run for elected office after 1965, Harder remained active in Albany politics, allying himself with insurgent groups like the Albany Independent Movement (AIM), the Liberal Party, and The Brothers, groups that challenged the Corning-O’Connell organization’s political dominance and exposed public corruption, such as the five-dollar vote and the practice of allowing elected officials to live outside of their districts. 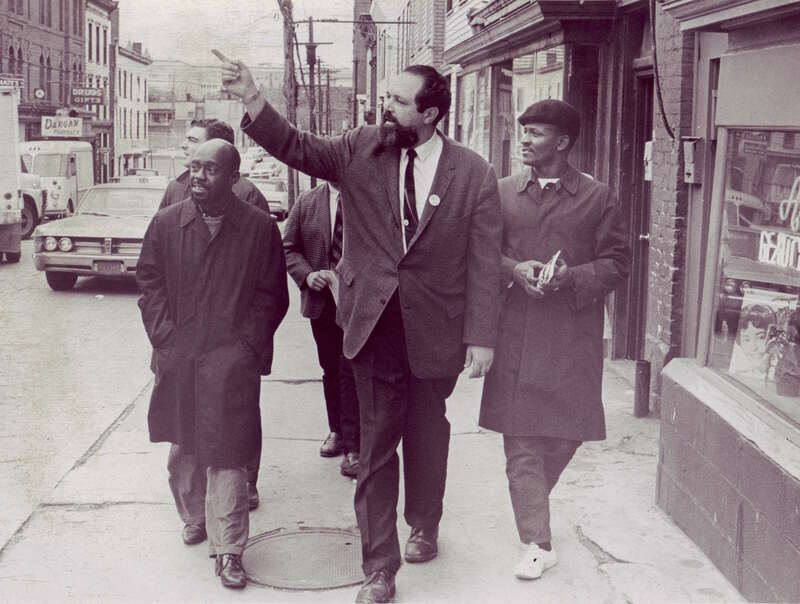 Liberal Party candidate J. Lawrence Katz walks Arbor Hill with Leon Van Dyke and Robert Gates of The Brothers, October 1968. Used by permission of the Times Union. Time was not on the organization’s side. After his 1964 loss, Harder remarked that “the Albany machine gets older each day without attracting any new blood or new ideas.” Harder may have been ahead of his time, but he correctly predicted the O’Connell-Corning machine’s demise. As the organization’s leaders died off and its adherents moved away in the 1950s and 1960s, a new, more racially diverse and politically active generation moved in. Although he failed to win elective office, Harder’s persistent challenge helped plant the seeds of a political awakening that would eventually eroded the power of Albany’s long-lived Democratic machine. Note: The featured photo of Harder (with his sons Michael, George, and Thomas) tacking up a campaign poster in front of City Hall appeared in the Times Union on Aug. 28, 1962. Used by permission of the Times Union. Previous Post Hoax or Hope?